State elections have propelled Alternative für Deutschland, or A-f-D, into Berlin’s legislature for the first time. In some districts of the capital, over 50 percent of voters chose the party. They are now in ten of Germany’s sixteen state parliaments. So who are the supporters of A-f-D? And why do they back a party said to be anti-refugee and anti-Islam? We caught up with some A-f-D supporters at a street festival in East Berlin – just before the state elections. One teacher, who spoke to insiders, said he had never belonged to a political party before. “I support AfD because I feel the politics of the traditional parties are ‘supposedly’ without alternatives,” said Stefan Kretschmer, an Alternative für Deutschland member. An alternative to mainstream politics. But also an alternative to a country changing too fast, especially when it comes to refugees and migrants. “Berlin has to become clean again. There are so many things where we have put the wrong priority. At a community level but also at a regional level,” said Marianne Kleinert, another Alternative für Deutschland member. Another member, Herbert Mohr, added: “I wouldn’t say we are Islamaphobic, we are a critic of Islam. Every Muslim who is living in Germany and who is practicing his religion is completely accepted. A polite way of saying Islam is not compatible with German culture? Yet not everyone agrees. For far-left protesters, A-f-D is no alternative. It’s provocative, divisive and extreme. Labels one A-f-D supporter denies. “They yelled at us, calling us Nazis and racists. All these lies, I, we altogether refuse this. We aren’t. But they give us this label,” said A-f-D member Stefan Kretschmer. There is no denying that the A-f-D is drawing more and more support from Germans fed up with centre-right and centre left political parties. But it has also gained support riding on a political platform which blames refugees and migrants for draining Germany’s social welfare budget. 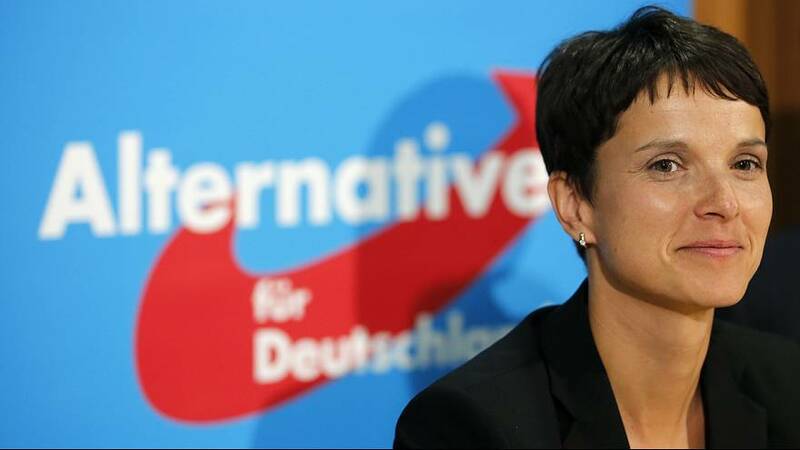 Frauke Petry who heads the the A-f-D is not without controversy. Her alleged call to allow police as a last resort to open fire on refugees at the border was branded as far-right and populist. She’s been compared to other European populist leaders who use a far-right, anti-refugee, anti-immigrant rhetoric to garner votes. “No. We often ask the question what kind of political party are we? Look at people voting for us, look at people joining us. We have lots of conservatives and liberals joining us,” responded Petry. “We get support from all corners of the political spectrum. To put us in a right corner is something that is quite known in Germany because putting someone there will help demonise him. The Alternative for Germany was born as an anti-euro movement in 2014 at the height of the Greek bailout crisis. But it was last year’s refugee crisis which helped propel AfD into the political spotlight. While other EU states closed their borders, Germany opened its doors to an estimated 1.1 million refugees. “What we are experiencing now is something that will occupy and change our country in the coming years. We want this change to be positive, and we can accomplish that,” Merkel said in September 2015. Christa Senberg volunteers at a refugee centre near her home in Brandenburg. It’s an area where refugees are few in number, but the fear is great. A fear stoked when it got out that the government will spend 16 billion euros in support this year alone. “The A-f-D is using the refugees to convince the socially disadvantaged people that their situation would be much better without them,” said Senberg. “For me it’s no surprise. We always warned that in Germany’s social domain something had to change. If not, someone would come along and grab all these people. Mohamed Taha Sabri is an Imam in Berlin. He came to the city 27 years ago from Tunisia, escaping the dictatorship under Ben Ali. He says while his community is well-integrated in Berlin, he worries that the A-f-D’s position on Islam as the so-called enemy of German culture, could worsen tensions. And when he reached out to political parties for a round table dialogue, there was one no-show: the A-f-D.
“At the last moment they declined, pretending that our mosque was not a neutral place for dialogue. And that they would be ready to talk, but at a neutral place, with Muslims,” Mohamed Taha Sabri told insiders. With the A-f-D’s growing presence in state parliaments, it is widely expected to enter the Bundestag in next year’s general elections. But can it continue to use fear – fear of change, fear of losing sovereignty among others, as a main political tool? She responded: “Yes, well, first of all, look at the driving forces of humanity. What are the driving forces? One of them is fear. And to pretend that politics lives without fear, lives without the feeling that evolves in people, is again not really honest. So that is one fact. “On the other hand, to all the people who tell us that we frighten people, I normally say, look at the problems that are there,” Petry continued.